Reduce your travel impact with Less Emissions today. Reduce, conserve and be more efficient. For those products and services you use, switch to green, more environmentally friendly alternatives. When it comes to your energy needs, Less' parent company, Bullfrog Power, offers easy, affordable ways to choose green electricity, green natural gas and now green transportation fuel. For t​hose emissions you can't reduce or eliminate — your air travel-related emissions — count on Less to offset them. For more on The Less Approach, click here. Air travel is a wonderful benefit of modern life — but we all know it creates harmful emissions. Make the responsible travel choice with Less Emissions today. Less Emissions helps people and organizations mitigate travel emissions quickly, effectively — and with the highest quality offsets in Canada. You'll lessen your environmental footprint, support innovative emissions reductions projects and ultimately make the responsible decision for our planet when you travel. Our customers have offset more than 7,000 tonnes of carbon. Less is ranked as the highest quality offset provider in Purchasing Carbon Offsets: A Guide for Canadian Consumers, Business and Organizations released by the David Suzuki Foundation and the Pembina Institute. 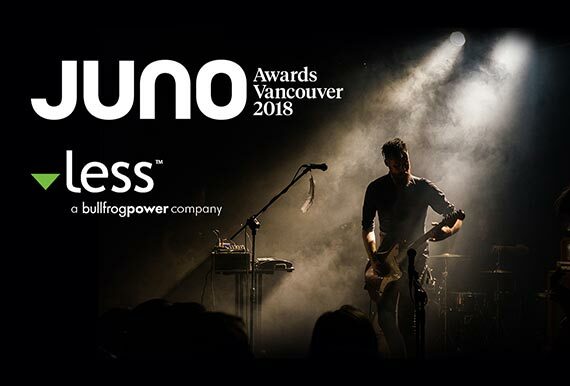 The 2018 JUNO Awards turns up the volume on climate change with Less Emissions Inc.